Growth in crypto market cap: cryptocurrencies have experienced around 100x growth in the past 6 years. Loss of dominance by Bitcoin: while Bitcoin constituted more than 90% of crypto market cap in 2013, today it constitutes around 50%. The article is structured as follows. 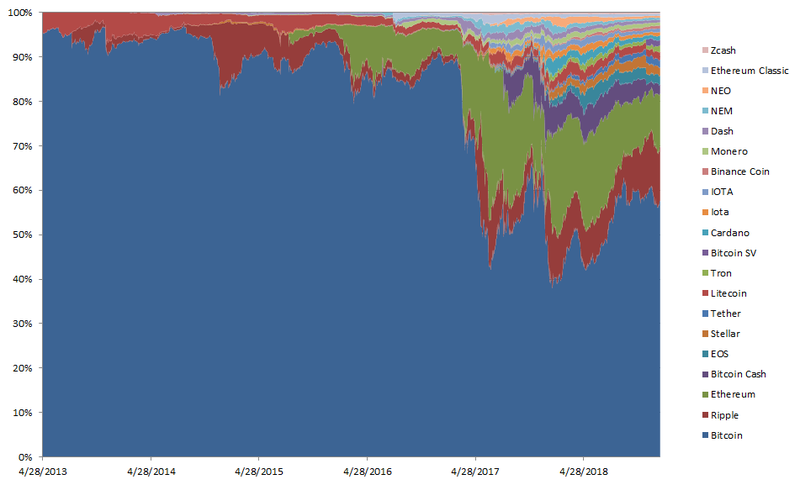 The first section analyzes the market cap composition for the top 20 cryptocurrencies over time. The second section compares the crypto market cap to traditional asset classes. The final section concludes. Table 1 shows the top 20 cryptocurrencies by market capitalization considered in this research. 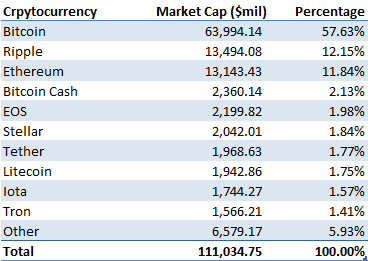 As the figure shows, the current total market cap for all the cryptocurrencies is around $111 billion. Figure 1 shows the distribution of the crypto market cap for the top 20 cryptocurrencies. As it can be seen from it, over 80% of the total market cap is in the top 3 cryptocurrencies, with Bitcoin having 57.63% of the total. Figure 2 shows the evolution of the crypto market cap in billion of US dollars over time. As it can be seen from it, the cryptocurrency market cap is very volatile, in a similar way to the crypto prices. It went in fact from around $1.5 billion in April 2013 to $111 billion in January 2019, an increase of around 100 times in almost 6 years. 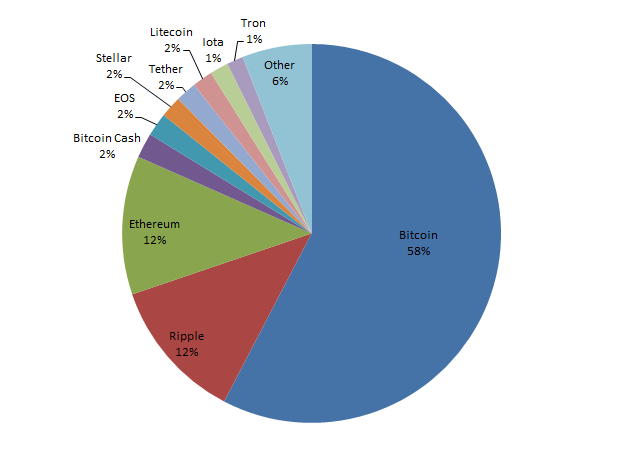 Figure 3 shows the composition of the market cap by cryptocurrency. 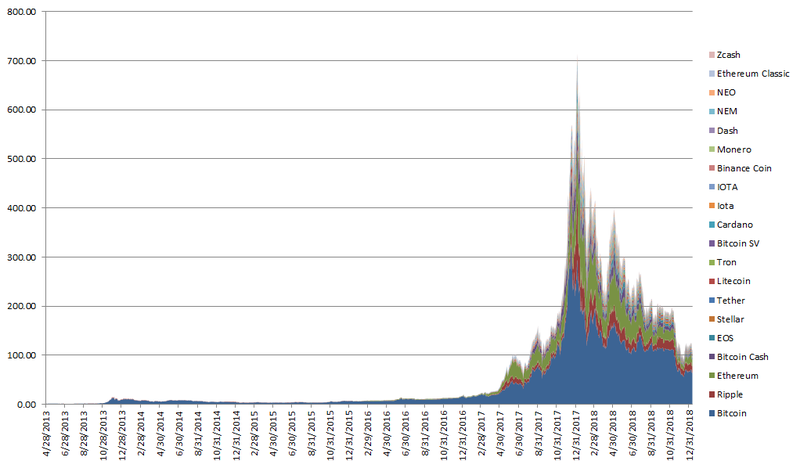 As the figure shows, Bitcoin lost its dominant market share during the analyzed period, going from around 95% of the total market cap in April 2013 to around 57.63% in January 2019. Cryptocurrencies that have been quite successful are Ethereum, used in ICO through ERC-20 tokens, and Ripple. Both in fact have managed to achieve around 12 percentage points in market share during the analyzed period. The next section puts the crypto market cap into perspective by comparing it to traditional asset classes. Figure 4 shows the market cap of Bitcoin and cryptocurrencies compared to traditional asset classes. As the figure shows, despite their tremendous growth in the past 6 years, cryptocurrencies and Bitcoin still have a very small market cap compared to traditional asset classes. In particular, their market cap is still lower than Amazon, currently the largest publicly listed company by market cap in the US stock market. This data shows that crypto is an emerging technology that has the potential to become a new asset class, but it still has a relatively small market cap. 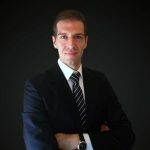 Crypto is a new technological innovation that has experienced tremendous growth in the past 6 years in terms of market capitalization. Nonetheless, it is still quite small compared to traditional asset classes like equity and bonds. We will probably need another 5 to 10 years before considering crypto a relevant asset class in terms of market capitalization.